Your small-town ski hill and recreation area on the Big Lake. The adventure is yours at Mt. Ashwabay. Join us at the hill during open hours for your choice of winter sports from downhill and cross-country skiing to fat tire biking to snow tubing. All hours of operation are subject to conditions. The warming room next to the chalet is accessible with a trail pass. Grab your friends and join us for youth night every Saturday starting at 3 p.m.
Get your alpine, nordic, or all mountain passes and save! Deals for first-timers, students, seniors, and more. Mt. 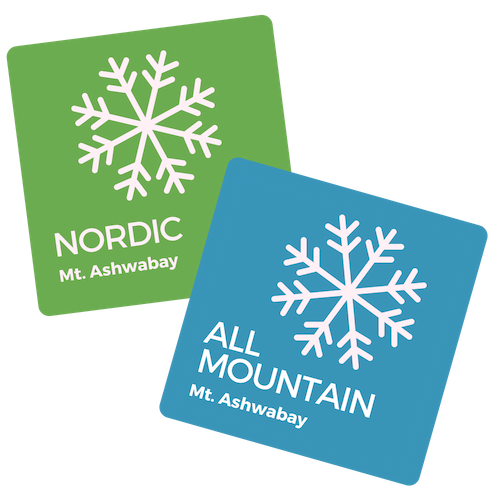 Ashwabay is a non-profit ski hill and outdoor recreation area in Bayfield, Wisconsin overlooking Lake Superior and the Apostle Islands National Lakeshore. Our facilities are cozy and modest to make way for the miles of peaceful terrain maintained and supported by our community of volunteers and donors. ​Join us at the mountain for a laid-back day of skiing, snowshoeing, hiking, or biking. We'll be here to say hello and make you feel at home.